Monitor Audio acquires Roksan Audio | What Hi-Fi? It may not bag the same headlines as Samsung buying Harman for $8 billion but in the audio world, Monitor Audio acquiring Roksan is a pretty big deal. Monitor Audio announced the news in a Facebook post, which claimed there was "incredible synergy" between the two companies' product ranges. The post stated: "Like Monitor Audio, Roksan is a British company committed to superior audio performance with a reputation for design excellence, premium quality and exceptional value... We are excited about the possibilities this acquisition offers." 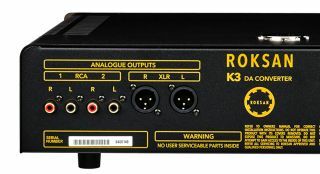 Monitor Audio managing director Andrew Flatt told whathifi.com: "Roksan had been up for sale for a couple of years, and I indicated two years ago what I was willing to pay for it. The owner approached me four weeks ago and we agreed a deal. It's a retirement sale [co-founder Tufan Hashemi has left the business]. "As Monitor Audio already operates in 100 countries, we believe we could triple Roksan's sales pretty quickly. The company needs modernising and bringing into the twentieth century, so my management team has gone in to sort it out." Roksan's current 17 staff have now joined Monitor Audio and Roksan will continue to trade under its own brand name. Flatt says he is looking to make further acquisitions having "turned down some other struggling electronics companies in the last six weeks". Monitor Audio, which began life in Cambridge but now operates out of Essex, is well known not just in the UK but around the globe, primarily for its speaker ranges, notably the multi-Award-winning Bronze speakers. Roksan has its HQ in London and having made its name with turntables, such as the Radius (the company recently revealed a pink model), now turns its hand to electronics and speakers. The company was founded in 1985 by Tufan Hashemi and Touraj Moghaddam. It was acquired in 1996 by Verity PLC, which at the time owned the Mission, Quad and Wharfedale brands. When Verity demerged two years later to focus on making flat-panel speakers, Hashemi and Moghaddam bought Roksan back. Touraj Moghaddam resigned his directorship of Roksan in 2011 and founded Vertere Acoustics, which specialises in turntables and cables.